Edgar H. Schein (born 1928), a professor at the MIT Sloan School of Management has had a notable mark on the field of organizational development in many areas, including career development, group process consultation, and organizational culture. He is generally credited with inventing the term corporate culture. Schein identifies three distinct levels in organizational cultures; artefacts and behaviours, espoused values, and assumptions. The three levels refer to the layers of corporate culture. Artefacts include any tangible or verbally identifiable elements in an organization. rchitecture, furniture, dress code, office jokes and history are all organizational artefacts. Values are the organizations stated or desired cultural elements. This is most often a written or stated tone that the CEO or President hope to exude throughout the office environment. Examples of this would be employee professionalism, or a family first mantra. 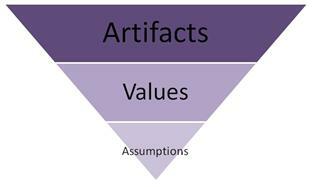 Lastly, assumptions are the actual values that the culture represents, not necessarily correlated to the values. These assumptions are typically so well integrated in the office dynamic that they are hard to recognize from within. Edgar Schein was educated at the University of Chicago, at Stanford University where he received a Masters Degree in Psychology in 1949, and at Harvard University where he received his Ph.D. in social psychology in 1952. He was Chief of the Social Psychology Section of the Walter Reed Army Institute of Research while serving in the U.S. Army as Captain from 1952 to 1956. He joined MIT’s Sloan School of Management in 1956 and was made a Professor of Organizational Psychology and Management in 1964. At the present he is Sloan Fellows Professor of Management Emeritus and continues at the Sloan School part time as a Senior Lecturer. He is also the Founding Editor of “Reflections” the Journal of the Society for Organizational Learning devoted to connecting academics, consultants, and practitioners around the issues of knowledge creation, dissemination and utilization. Schein has been a prolific researcher, writer, teacher and consultant. Besides his numerous articles in professional journals he has authored fourteen books including Organizational Psychology (3d edit., 1980), Career Dynamics (1978), Organizational Culture and Leadership (1985, 1992, 2004), and Process Consultation Vol. 1 and Vol. 2 (1969, 1987, 1988), Process Consultation Revisited (1999), and The Corporate Culture Survival Guide (1999). Schein wrote a cultural analysis of the Singapore Economic Development Board entitled Strategic Pragmatism (MIT Press, 1997) and has published an extended case analysis of the rise and fall of Digital Equipment Corporation entitled DEC is Dead; Long Live DEC: The lasting legacy of Digital Equipment Corporation (Berrett-Kohler, 2003). He was Co-editor with the late Richard Beckhard of the Addison Wesley Series on Organization Development which has published over 30 titles since its inception in 1969. Steinbergs, Alcoa, Motorola, Hewlett-Packard, Exxon, Shell, AMOCO, British Petroleum, Con Edison, the Economic Development Board of Singapore, and the International Atomic Energy Agency (on the subject of “safety culture”). Ed Schein currently serves on the Advisory Board of the Institute for Nuclear Power Operations, and the Boards of Massachusetts Audubon Society and the Boston Lyric Opera. Ed Schein has received many honors and awards for his writing, most recently the Lifetime Achievement Award in Workplace Learning and Performance of the American Society of Training Directors, Feb, 3, 2000, the Everett Cherington Hughes Award for Career Scholarship from the Careers Division of the Academy of Management, Aug. 8, 2000, and the Marion Gislason Award for Leadership in Executive Development from the Boston University School of Management Executive Development Roundtable, Dec. 11, 2002. He is a Fellow of the American Psychological Association and the Academy of Management. Prof. Schein is married, has three children, and seven grandchildren. He and his wife Mary live in Cambridge, Mass.